'If something tastes too good, it is probably harming your body'. Depending on how you wish to term your perspectives, cooking does not have to be a mundane chore, nor does detoxification. Yes, it might not give you that savoury ooomph sensation that many label to be an awesome meal, but are there not times where you wish you could have a light meal, shed a few pounds to fit into that pair of jeans in the closet? Treat it as an opportunity for you to invoke your inner creativity self and better still at the same time do some dieting. On a rather obscure note, I like to vision cooking as a comparable option to fashion. Ultimately, it comes down to what you decide to put into the pot or pan and what condiments to spice it up a notch or ruin it. Similarly for fashion, you decide the outlook with the apparels and accessories you have, mix and match and hey you might have your own dose of 'Gok's Fashion Fix' or maybe become the new icon for fashion disaster. I follow one simple rule when it comes to detoxification - Listen to your body. With some spare time over the weekend, we decided to visit the local grocer and bought ourselves some fresh organic ingredients to prepare ourselves a 'detox feast'! Apart from spending lots of close bonding time in the kitchen preparing food together, the best part had got to be the shopping of ingredients on a busy Sunday morning. Light-hearted jokes about the silly combinations of vegetable broth we might have for dinner just brought back a smile as I pen this entry. Personally, I felt that my detox session was not just a plain affair of improving one's physical health but an invigoration of my physiological being altogether. Rich source of flavonoid and polyphenois, which are powerful antioxidants. Contains minerals and vitamins that can strengthen the blood. Also contains malic acid and tartaric acid, that can help prevent disturbances of the liver and digestion. The skin of the apple contains pectin that can remove toxins from the system and more importantly prevent protein decay in the intestine. 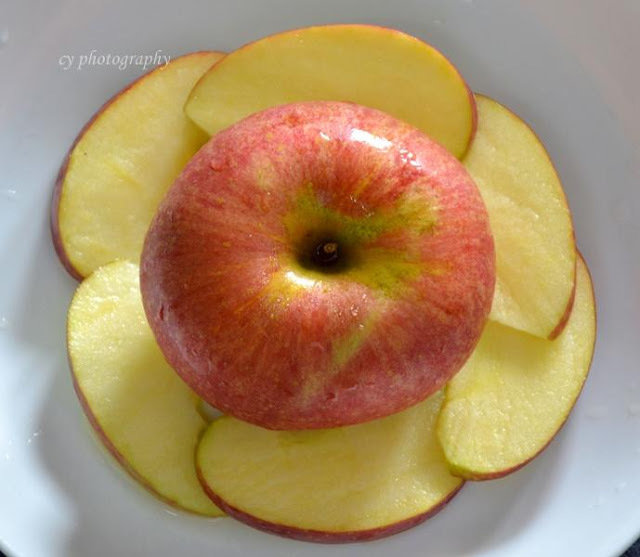 'An apple a day keeps the doctor away' - it does makes sense afterall considering it is also effective in lowering cholesterol and reducing skin diseases. Organic ingredients were being used for the soup: bittergourd (17 kcal/100gm), sweetcorn (86 kcal/100gm), tomatoes (20 kcal/100gm), enoki mushroom (42 kcal/100gm), celery (7cal/100gm), carrot (41 kcal/100gm), onion (32 kcal/100gm) and ginger (94 kcal/100gm) slices. (+) Low in calories, rich in anti-oxidants, dietary fibre and of course vitamins. Bittergourd: Rich in vitamins A, B-3, B-5, B-6, C, iron, zinc, potassium, manganese, magnesium and excellent source for folates which help reduce incidence of neural tube defects in pregnant mums. Protect against free-radicals responsible for aging and cancer. It also stimulates digestion and peristalsis, effective in relieving indigestion and constipation. Sweetcorn: Rich in vitamins B1, B3, C, folate, magnesium, potassium and antioxidants. Helps reduce chance of heart diseases and cancer. High levels of ferulic acid are being released which are effective in combating cancer. Regrettably, do note that canned sweetcorn and popcorn do not apply here. Tomato: Rich in Vitamins A, C, potassium and folic acid. Helps prevent scurvy (bleeding gums and joints soreness). Might be beneficial for people who suffer from easy bruising and combats common cold. Ideal for young children with asthma as they experience less wheezing. Lycopene gives tomatoes the distinct red color and is itself a strong antioxidant combating lung, breast, cervix digestive tract cancer and prevent macular degenerative disease that leads to blindness for the elderly. Enoki Mushroom: Rich in Niacin, iron and potassium. Protective effect against degenerative diseases like Alzheimers' and age-related decline in cognitive function. Also reduce inflammatory and cardiovascular diseases. Celery: Low calorie, rich in vitamins A, B1, B2, B6, C, calcium, potassium, folic acid, magnesium, iron, phosphorous, essential amino acids and dietary fibre. 'Negative calories' - one burns more calories digesting celery than from the consumption. Lowers blood pressure and contains at least 8 families of anti-cancer compounds to combat cancer. Carrot: Rich in carotenes, vitamins A, C, B-complex, copper, magnesium, manganese, phosphorous and calcium. Protection from skin, lung and oral cavity cancers. Beta carotene especially helps protect body from free radicals, improves vision, sperm production, maintenance of epithelial integrity, growth and development. Helps control heart rate and blood pressure by countering effects of sodium. Onion: Rich source of vitamins B1, B6, C, K, biotin, chromium, calcium, quercitin, flavonoids. Effective in combating tumours and have immune-enhancing properties. Helps thin the blood, lowers cholesterol, raises good type HDL cholesterol, wards off blood-clots, fight asthma, chronic bronchitis, hay fever, diabetes, atherosclerosis and infections. Believed to have antiviral and antibiotic effects. In addition, they are great detox tools and they latch on to mercury, cadmium and lead and helps flush them out of the body system. Ginger: Rich with antioxidants, and a powerful treatment of ovarian and colon cancer. There are reviews that it may also treat morning and motion sickness. Apart from therapeutic properties, it has an ability to inhibit formation of inflammatory compounds and is also a natural painkiller. With emphasis on its effectiveness in alleviating gastrointestinal distress, it has the ability to relax and soothe intestinal tract. Rich in beta carotene, iron, vitamin A, C, potassium, calcium and folic acid. 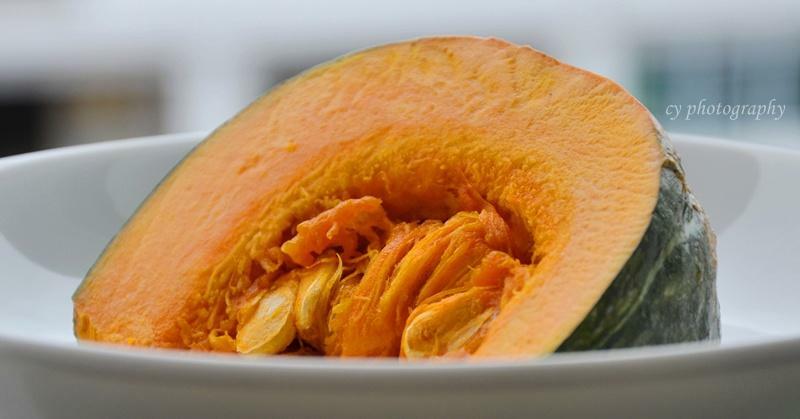 It boosts the body's immune system, and its source of alpha-carotene has ability to slow aging process and reducing risks of cataract formation. In addition to reducing risks of eye problems, it is also full of potassium which helps lower risk of hypertension. The abundance of amino acids aid in maintaining brain functions and are beneficial to persons with health conditions like kidney diseases, parasite infections, colon and prostate cancer. Contrary to popular belief and assumptions, detox meals do not have to be bland and boring. Depending on individual, the 'vege-taste' might be too overwhelming for some if you were to make juice out of the above ingredients. We decided on a very simple, no frills meal, by slicing and dicing up the plate of organic vegetables and make soup out of it. The apple was consumed on its own with the skin. Likewise for the kabocha, it tasted pretty much like sweet potato after being in the steamer for about 15 mins. We felt cleaner and fresher, not sure we were just being self-delusional, but with the research we made, I believe we are on the right track! As part of our living motto, 'live to eat', it is important to have one of those much needed detox sessions once in a while to cleanse our body system of toxic substances and harmful radicals. The busy lives of urban-dwellers nowadays usually encompass dining out due to the lack of time to prepare a wholesome meal. Over time, the accumulation of excessive cholesterol, trans fat, sodium from those 'oh-so-yummy-MSG-laden' seemingly 'indulgences' would lead to your greatest nightmares in the form of heart diseases, diabetes etc. Let us all start to make a difference and pamper our body with some healthy food so that we can all live to eat! remember always, make your calories count.